This was by far the best homemade pizza I have ever tasted. I made this pizza last night and my family loved it. We usually get our deep dish fix from Nancy's here in Atlanta. Who needs to go out when this recipe was so easy and delicious! Preheat the oven to 350 degrees F. Press the dough into the bottom and up the sides of a greased baking dish. Sprinkle mozzarella cheese evenly over the dough. Heat a large nonstick skillet over medium-high heat. Add 1 teaspoon olive oil, garlic and onions; cook until lightly browned, stirring constantly. Add tomato paste; cook 1 minute, stirring frequently. Stir in oregano, diced tomatoes, and tomato sauce; simmer for 5 minutes or until sauce mixture is slightly thickened. Spoon tomato sauce over the mozzarella cheese. Sprinkle Parmesan cheese over the top. Bake for 25 to 35 minutes or until crust is golden brown. Let pizza stand 10 minutes before serving. Oh my! This looks absolutely yummy! I'm going to check on the stuffed version too. Brandi, your blog looks great. I love your outside makeover, milkshake, stepladder and now this pizza. Congrats and thanks for sharing! Mmm, that has my stomach growling and it's only 9 am! My hubby doesn't eat pizza anymore, but I can definitely see making this for me and the kids. I never knew the ingredients were reversed. As a native of Chicago, I am very much familiar with this style. This was a nice nod Brandi. I'll have to try it out. .. especially white with spinach! 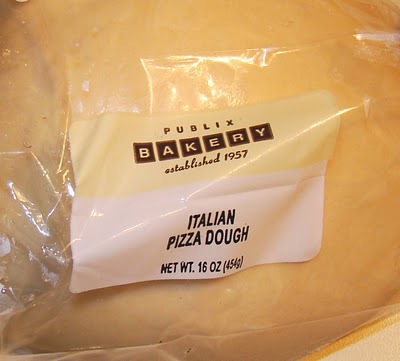 Walmart sells REALLY good dough.. .88 cents a bag!! I love making my own pizza and this looks so good with all it cheesy deliciousness!! Have you been talking to my husband? He's been asking for homemade pizza! Looks great ! I bet it was fun for the kids to help make. Btw thanks for giving me heads up re: the win I wasn't aware.have a great rest of the week! That looks like a delicious recipe for deep dish pizza. I bet you save a lot of money enjoying homemade pizza :) I wanted to invite you over to show off your recipe at These Chicks Cooked Recipe Spotlight today. Have a great day! Uh oh...I can almost smell it!! You always make me want to get in the kitchen! Keep it coming girl! We just love pizza and your pizza looks so delicious. I sure would love to have a slice or two. Thank you so much for sharing with Full Plate Thursday and hope to see you next week! Same as Rosemary...born and raised here in Chicago and know Chicago Style well. I'll have to give this recipe a try. But if I screw it up I can easily call Lou Malnati's, Giordano's or Gino's East!